(Bloomberg) -- The bond market remains confident after the latest U.S. jobs data that the Federal Reserve’s next move will likely be to lower rates. 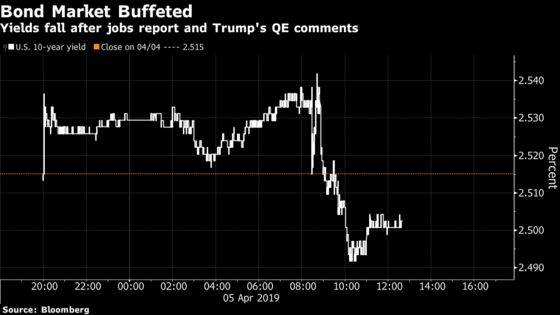 But traders are scratching their heads when it comes to President Donald Trump’s suggestion that policy makers should restore quantitative easing. Traders see about a 70 percent chance of a quarter-point Fed cut in 2019, even as a report Friday showed U.S. hiring in March rebounded more than analysts expected. But that doesn’t mean the market views the economy as weak enough to justify Trump’s call less than two hours later for the Fed to open the monetary floodgates. The yield curve from 3 months to 10 years flattened modestly after the president’s comments. But it’s still in positive territory after briefly inverting last month for the first time since 2007. The inversion, a potential recessionary signal, came amid a darkening global economic outlook. At 2.5 percent, the 10-year Treasury yield isn’t far above the lowest levels this year, reached last month. It fell about 1 basis point Friday after the jobs report. Payrolls rose 196,000 in March, beating the median estimate in a Bloomberg survey and rebounding from an increase of 33,000 in February. Yields briefly extended their daily decline after Trump’s comments Friday, in which he maintained his pressure on the central bank over monetary policy. The Fed last month signaled a prolonged pause on policy after nine rate hikes since 2015, while flagging risks amid slowing global growth. Bond investors have been assessing that backdrop, from trade friction to cooling economies in Europe and Asia, and predict easing is the likeliest path.